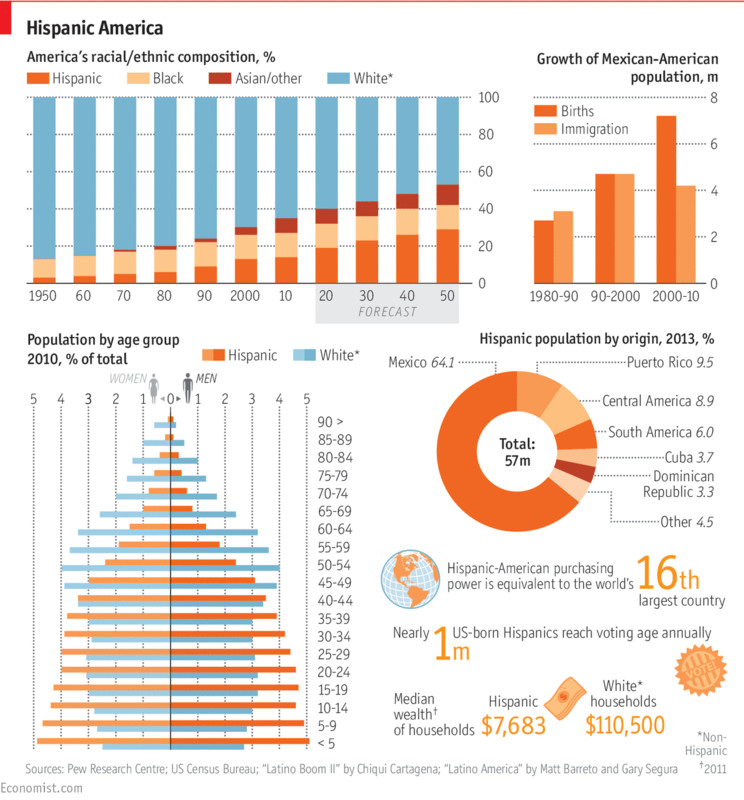 "Tu Casa Es Mi Casa"—ECONOMIST Says White Decline Provides "Challenges And Opportunities"
The ECONOMIST has a big article on the Hispanicization of America, with the above amazing chart (click to enlarge). AMERICA is a country built by immigration, but nothing in its history compares to the rise in its Hispanic population. Changes to immigration law in the 1960s triggered a decades-long surge in arrivals, taking the Hispanic population from just 7m in 1970 to 57m today, a number that is set to double by mid-century. At that point one in four Americans will be of Latino descent. In relation to the population of the day, there have been proportionally larger surges in the past, notably involving European migrations in the 19th and early 20th centuries. The Economist, as we've been reporting since 2000, always takes the economistic pro-immigration view, but their reporting is good enough that many significant facts creep through into the light of day. However, all these projections are based on immigration policy continuing without change—consider what that projection would look like with a moratorium on immigration and a significant effort get illegals out of the workforce. Self-deportation is as much a function of market forces as illegal immigration, and America's early immigration history featured a significant percentage of immigrants deciding to go home.